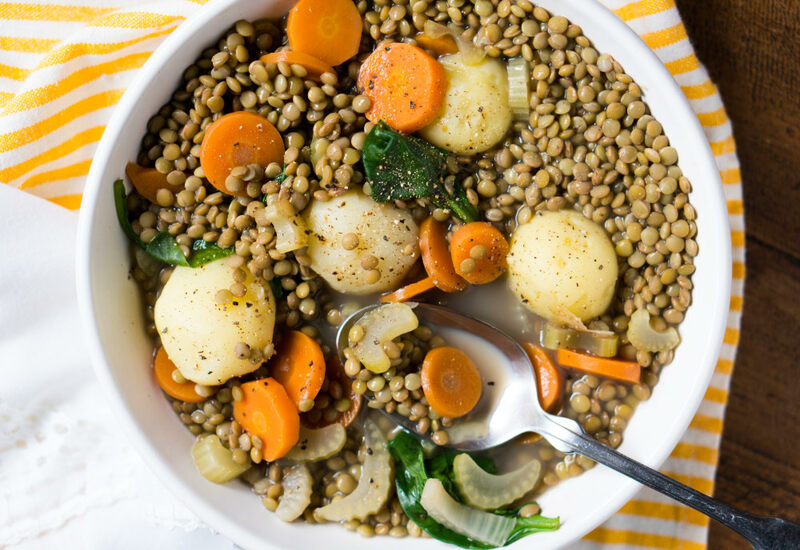 This vegetarian and vegan Lentil Stew is incredibly warming and absolutely delicious! Using your pressure cooker makes for a quick meal. In fact, you will sit down to dinner in less than an hour. This stew is seasoned with thyme and a bay leaf. According to tradition, they say whoever gets the bay left in their stew gets to kiss the cook! Be sure to invite all your favorite people around the dinner table when serving this lovable lentil stew for supper. Did you run out of broth? No problem - substitute the same amount of broth with water and simply increase the amount of vegetables! Try a few potatoes cut into large pieces. Also, you can replace the spinach with kale, if you prefer. Per Serving: 158 calories; 7g fat; 18.1g carbohydrates; 7g protein; 0mg cholesterol; 1050mg sodium. This is a great recipe for meatless Mondays. It's hearty and filling, so you don't really miss the fact that there is no meat. The lentils, which I've only ever cooked with twice before, turned out really good. This recipe makes me want to expand my horizons more and try different vegan and vegetarian stews. I've cooked with lentils a handful of times. They're so incredibly versatile. 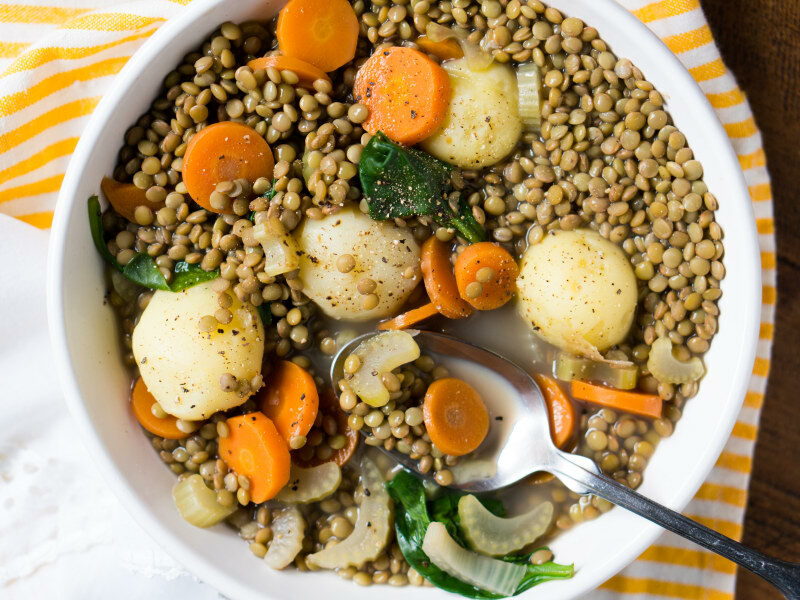 This lentil stew was surprisingly filling. The carrots and potatoes were the perfect addition, and really gave this vegan recipe an authentic stew-like feel. I think I found my new winter recipe! I tried this recipe with half water and half low sodium broth to cut down on the sodium. Due to health issues, we try to keep sodium low in our family. This soup was still packed with flavor! I didn't follow the suggestion for potatoes, but did add kale to the spinach and it made for a nice healthy night time meal! 55 mins is speedy for a fresh, vegan soup. This dish is a good introduction to vegan stews but I prefer meatless stews with a wide variety of vegetables. I added in some rough chopped sweet potatoes, stewed tomatoes, corn and lima beans. I also added a cajun spice blend to add more flavor.